The claim, “facelift in a bottle,” implies instant results. Do any of these products that make that claim really work? Yes, but finding the right one can be a challenge, especially one that is all natural. Do you want a “facelift in a bottle” solution that gives you an immediate effect but over the long term is damaging to your skin? Or would you like visible results from the first application and long term benefits (with continued use) to help you look younger and younger? How can you make an intelligent decision about which product is right for you? The key element to any anti-aging program is to stop doing the things that are destructive to your skin and start doing more of the things that are helpful to your skin. Consistency is a key element in any anti-aging system. The skin care regime needs to be one that is regularly practiced in order to see the fullest effect on the skin. There are no quick fixes in natural anti-aging, but there are substantial changes that can be made to benefit aging skin. Why Choose a Facelift in a Bottle? Who wouldn’t rather apply a natural product to the skin than go under the knife and allow a surgeon to cut on your face. Most skin care products that promise facelifts without the sutures are formulated with various ingredients. In doing your research, you will see and a lot about collagen. The reason collagen is mentioned so frequently in products is because collagen fibers are part of the skin matrix that holds your skin tight. Collagen is a complex component of your skin that has a lot of elements involved in its structure. Can you add synthetic collagen or collagen made from chickens to your skin as a substitute for your own collagen? No, even if you could get some through the skin because of its large molecular size virtually none will and even it did at best it would just provide a temporary filler. Your body makes it’s own collagen from a wide array of nutrients. Nature’s Transdermal Face FoodTM and our Face Lift Cream Natural Fusion Fast-Firming Facelift CreamTM are excellent products to increase collagen production because they provide your facial skin with what it needs to make its own collagen and elastin. You will also see various names of Retinol as ingredients on products. They carry that name because they want you to associate their ingredient with the drug Retin A-that dermatologists have been using as an exfoliant to treat acne and, in some cases, sun damaged skin. The drug is a powerful synthetic version of vitamin A that could do more damage than repair if you don’t do it properly. Only a doctor is qualified to use that drug. Don’t be misled by any over the counter product with some version of that name. Save your money and instead purchase an all natural product like Nature’s Transdermal Face FoodTM, or Biozyme Skin Peel which is an excellent exfoliator. Most products that claim to be a “facelift in a bottle” usually include some moisturizing ingredients. Usually it is a water and oil mixture that works by the oil trapping the water on the skin and allowing it to seep into the pores before it can evaporate. Unfortunately, most moisturizers contain synthetic oils made from petroleum and the water is some filtered tap water. Those are ingredients that you don’t want on your skin if your serious about any kind of anti-aging program. Instead look for an all natural product with natural oils like olive oil and fresh spring water. 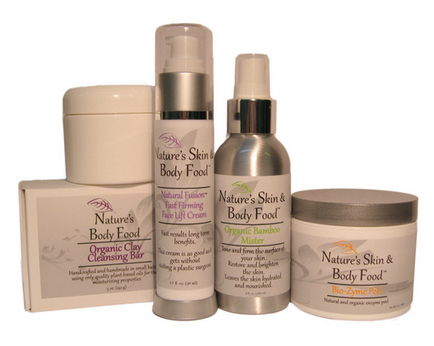 All of our products at Nature's Skin and Body Food contain all natural organic ingredients. The reason a consumer may opt for a “facelift in a bottle” product rather than a traditional facelift, is often about money and risk. The traditional facelift comes with a great price tag and an even greater potential for risk. These risks, or side effects, can include permanent disfigurement and even death. Not to mention the cost of the surgical facelift. A ”facelift in a bottle” can be a less costly and much safer alternative to a traditional surgical facelift. While the anti-aging skin care product may works wonders alone, the addition of a total skin care regime will improve the look of the skin even more. Why settle for looking 10 years younger when you could look 20 years younger? The “facelift in a bottle” can be paired with regular exercise, fluid intake and good nutrition to improve total body health. The healthier the body is, the healthier the skin will be. Skin care also works hand in hand with preventative health care. There are illnesses and prescription medications that can reduce the elasticity of the skin or the fluid in the body. In each case, the fine lines and wrinkles most problematic to the aging man and woman may appear deeper as a result. Maintaining a healthy skin care routine and life style throughout the treatments and illnesses can reduce the effects of those stresses on your skin. Good skin care reflects a balance between life, life’s speed bumps and time.